If you want to avoid the hassle of going out on New Year's Eve, you can always host your own New Year's Eve celebration at home—and it doesn't have to cost a lot, either. A few basic tips: Host your party after dinnertime so guests don't expect full entrees. Limit your guest list and make it a BYOB potluck-style gathering so you don't have to spend too much on alcohol and party food. And since some fizzy drink is expected at most New Year's Eve gatherings, you can opt for cava or prosecco instead of champagne for a cheaper alternative that most people probably won't notice when they drink it. To add a little New Year's Eve pizzaz without breaking the bank, simply decorate the walls with white Christmas lights and set up some tea light candles. To go the extra mile, decorate desserts with edible glitter and make some fun DIY headgear for your guests to wear. 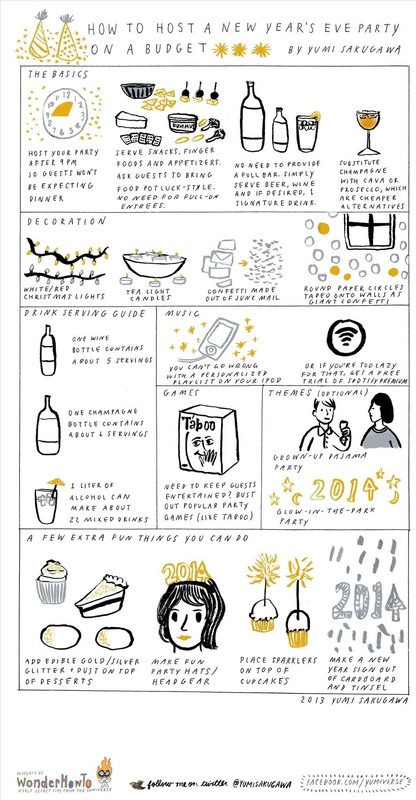 Got your own tips for hosting a cheap and DIY NYE party? Share with us!